In the hands of thestickerman. Use TB2QAD4 to reference this item. 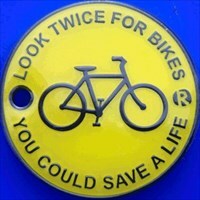 I received this coin from Maine Family, my Nana, to set free for bike awareness. My Nana is helping me with this because I am only 4 years old. I am learning to ride a bike. I have an adult with me at all times but being 4 I don't always listen. As I learn to ride my bike, I wear a helmet, knee and elbow pads. They are teaching me how to do things right. Nana has been participating In Todie's Wild Ride where they send out coins to promote bike awareness so there won't be any more accidents. My Nana gave me this coin to send out because I like coins and I can see where it goes. Pick me up and think about all the things you have to watch out for as you travel the roads. Nana and Papa loves me and doesn't want me to get run into so I hope you will watch out for all us kids riding our bikes. From this fellow Mainiac will help this tb move along. Dropping this one off for the next cacher to move along. This entry was edited by djbtex on Saturday, 18 August 2012 at 12:05:09 UTC. Visiting in my home town before heading out on a new adventure. This entry was edited by djbtex on Friday, 10 August 2012 at 12:10:37 UTC. Visiting this in the cache where I found it so it can get the proper mileage. Don't know how it got from Illinois to Florida but that is where I found it. Will move it along shortly. Picked this one up today from a cache in Florida GC6DC9 and will move it along shortly. Thank you for letting us carry your travel bug with us. Sorry we held onto it for such a long time. We will keep an eye on this tb!! 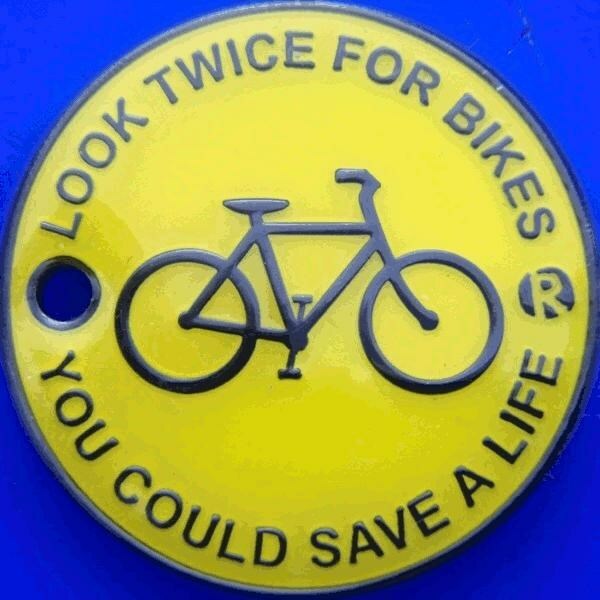 Your Nana & Papa are very smart to teach you how to be safe while riding a bike!! Even when you get older you should still be careful. We still wear helmets, riding glasses, and gloves every time we go out on a ride. We also don't wear an I-Pod because you really need to listen to what's going on around you as you ride!! You can't hear someone calling, "On your left" as they pass you, or a car's horn if you are wearing an I-Pod and that could cause an accident!! Be cool and stay safe and we hope one day we will see you riding your bike on the trails! !